The Danish cartoons which caricatured the Prophet in different ways (including depicting him wearing a headdress shaped like a bomb), has stirred up, not surprisingly, a hornet's nest of controversy. It is yet another (in this case, somewhat silly) manifestation of an ongoing process in which secular society, acting according to an internal impulse, periodically lampoons various sacred icons. The cartoons could have confined themselves to satirizing specific politically motivated actions and still made their point, but instead targeted the principal foundations of the faith (the Prophet and the Qur'an). Reversing the values and meanings traditionally associated with religious iconography, personages, and texts is a common mechanism to deaden the seriousness and sacredness with which a religion's metaphysical connections are viewed. This is done most simply by subverting the language, images, and sacred contexts of religion through mockery, ridicule, and stereotyping. Such a process is a natural byproduct of a world in which religion has largely been undercut, bypassed, or eliminated and its influence rendered innocuous and irrelevant to the political, economic, and social order of society. In such a world, religion belongs primarily to the private sphere and even there anyone who immerses themselves too deeply in it is liable to be considered as eccentric, peculiar, or suspect - and those who try to organize their outward life according to religious dictates are viewed as a danger to secular values. This is the emerging and (currently) dominant Western reality - and any dominant force naturally does what is necessary to secure and solidify its position. In such a situation, the greatest annoyance and danger is from those who have not sufficiently acquiesced to the new state of affairs, and who insist on clinging to "outmoded" paradigms, to ways of thinking that have nothing to do with the "real" (secular) world. One way of counteracting them is to undercut the sacred foundational, metaphysical symbols which are the outward form of an inward belief. Even if this has little impact on the followers of the religion, it is useful domestically in stereotyping and negatively objectifying that which is considered a danger to secular society (thus undermining it's influence). Symbols, texts, iconic personages, and rituals are the architecture, the geometry, the symbolic worldly aspect, the formalized representation of metaphysical realities and of the human connection to these realities. 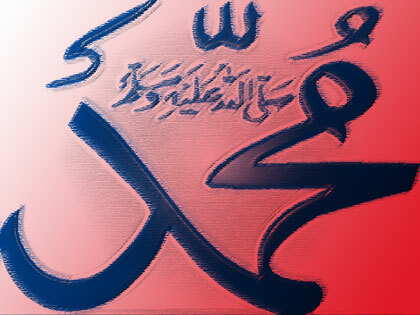 For Muslims, the Prophet is the human representation of the writing of the Divine pen. He is the one on whose heart God wrote His revelation and whose inner being is joined to God's Throne. His inner reality (his form) is representative of an exalted metaphysical architecture. Demolition of a sacred architecture is part of the secular process of discarding the infrastructure of religion. Once this demolition is underway, the refugees are then invited to take shelter instead among the symbols of secular society. The weakening of the metaphysical symbols is accomplished in part by attempting to turn the traditional meanings connected with the symbols upside down. The Satanic Verses was one case where an entire reverse symbology was applied to the Prophet (in the person of Mahound) and his wives. Whatever the literary merits and critical prowess of the author may be, it is clear that a very debased inversion of meaning was attached to traditionally sacred images, personalities, and iconography. These challenges to traditional religion are thrown out now and then, and the proponents of the challenges believe this is a battle between artistic freedom (or even freedom itself) and a reactionary belief system. Traditional religious art is a sort of visual (or textual) metaphysics, but the art that mocks religion cuts at the metaphysical connections seeking to sever them with a stroke of the pen or brush. In traditional art, the "what" of the art has a greater weight than the "how" and even helps determine the "how". So the aim (the what) and the intention and the spirit underlying any art is of great importance. In the case of art that mocks the Prophet or the sacred texts of Islam, the debased "spirit", aim, and intention that underlies the mockery is clearly apparent to even the most obtuse. So, to the majority of Muslims this is not simply art or visual commentary or even comic caricature but is a provocation and a deliberate expression of rancor towards the foundations of their faith, masquerading, rather feebly, under the guise of artistic and literary license. This process of desacralization and debasment of religious iconography is likely to strengthen and increase in frequency and is an unfortunate and unsavory aspect of a much broader, far reaching, long term philosophical shift. However, it's also an issue that was encountered by Muslims in the Prophet's own time as is evidenced by several Qur'anic verses on the issue - the recommended response was patience and forebearance. If the Muslims remained true to their faith and course they would, in time, replace or modify the existing societal paradigms. If not, the issue would be handled in the akhira (the hereafter). The past few centuries have produced a series of mental shifts that have resulted in a succession of changes in society's focus and outlook (concerning man's approach and connection to religious sacredness) - these led to the opening of many doors and resulted in the closing of many others. The shifts relate to what it is that man turns toward in comprehending and interfacing with the reality around him. The question is - does what has been gained outweigh what has been lost? In general (starting in the west and spreading outward), vision shifted from looking towards transcendental realms and interpreting the material world in this light. It turned towards the material world and an epistemology of rationalism and empiricism which brought many material, industrial, and technological benefits even as it weakened traditional religion. The authority inherent in revelation was attenuated by this shift - a displacement of priority occurred - unseen and esoteric mysteries (which are not amenable to strictly discursive knowledge) slipped to the status of superstition or unverifiable mythology. Religion faded into a shadow existence - into romanticized but vague beliefs freed from direct divine speech or a divine law - or into ideological religion/religious ideologies, politicized and with superficial and crude hermeneutics - or into humanism - or relativistic religions - or invented/human-engineered religions - or new-age fuzziness - or revisionist/literalist religion. The expansion of some types of knowledge (material, instrumental, measurement based, outward facing knowledge) led to the weakening of and shift of focus away from other forms and modes of knowledge. Some would say these shifts were major tectonic events that jostled humanity from one mode of existence to another entirely different mode. The power bases and the determinant forces that shape the reality we live in harness technological, instrumental, external facing knowledge and thereby further accelerate and strengthen them and correspondingly marginalize other knowledges. Real material power, ability, and outward control flows from instrumental knowledge, not from metaphysical knowledge. Transcendent, sacred knowledge is therefore sidelined or discarded as impractical, outmoded, and irrelevant. Has man's mode of interfacing with reality truly undergone such fundamental shifts? - If it is the case is there even a possibility of regaining what has been lost (can one ever go back or is man's transformation a one-way metamorphosis) - or perhaps there is a way forward to a new mode that reconnects man with transcendent realities?